Russian author and translator; born at Stavropol, Caucasia, in 1871, receiving there his early education. In 1894 he was graduated by the faculty of Oriental languages of the University of St. Petersburg, with a gold medal for his dissertation "Svod Talmudicheskikh Svyedyeni o Gnosticheskikh Sektakh." Thence dates the beginning of his literary and scientific activity, his writings appearing in Jewish periodicals and as separate works. The more important of his works include: "Talmud, Yevo Istoriya i Soderzhaniye," part i., "Mishnah," St. Petersburg, 1897; "Chto Takoye Shulkhan-Arukh?" ib. 1899; "Talmud, Mishna i Tosefta," ib. 1899-1904, the first Russian translation of the whole Mishnah, and the first complete translation of the entire Tosefta into a European language. At present (1904) Pereferkovich is engaged in the translation of the Mekilta, Sifra, and Sifre. The critical translation of the Talmud, the most important of his works, was favorably received not only by the critics, but also by the general public, as is shown by the sale of more than 4,000 copies in a short time. 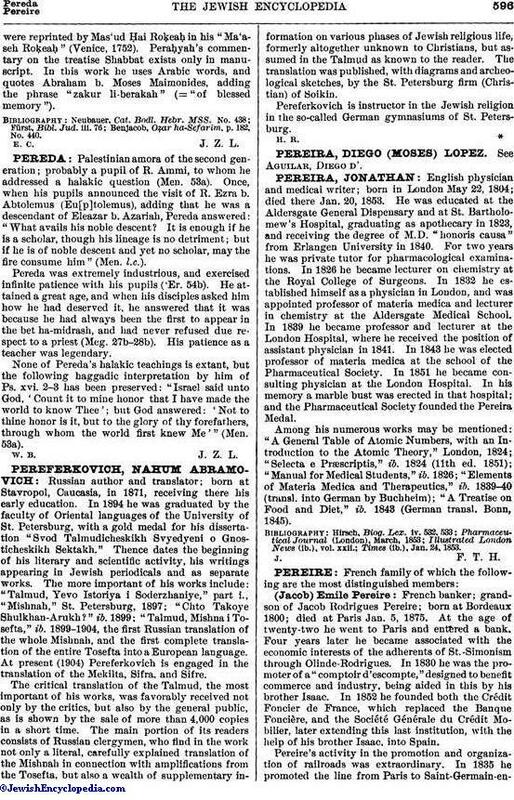 The main portion of its readers consists of Russian clergymen, who find in the work not only a literal, carefully explained translation of the Mishnah in connection with amplifications from the Tosefta, but also a wealth of supplementary information on various phases of Jewish religious life, formerly altogether unknown to Christians, but assumed in the Talmud as known to the reader. The translation was published, with diagrams and archeological sketches, by the St. Petersburg firm (Christian) of Soikin. Pereferkovich is instructor in the Jewish religion in the so-called German gymnasiums of St. Petersburg.